Euripides was a famous Poet from Greece, who lived between 480 BC and 406 BC. 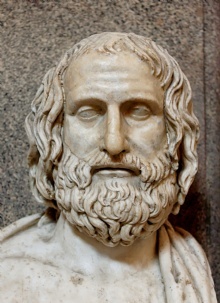 Euripides (or Euripides, Greek: Εὐριπίδης) was the last of the three great tragic poets of ancient Greece, after Aiskhylos and Sophocles. Euripides came from phyla, a village in Attica, but stayed mainly in Athens. He studied under Protagoras, and Socrates was one of the other students. In 408 or 407 he left Athens for the benefit of the court of Arkelaos, king of Macedonia, where he died. Euripides' influence has been enormous. He was, however, not representative of a community culture, so one can understand the tragedies of Sophocles and Aiskhylos. On the contrary, he was spokesman for a new era, sofistikken), and was therefore subject to much opposition and proportionality, which is clearly reflected in Aristophanes' comedies. He wrote probably about 90 tragedies and we know the name of about 80 of them. 18 has survived to our days. In drama competitions that took place during the great Dionysia, which was so important in ancient Greece, Euripides had only four first prizes in his lifetime even though he competed 22 times. The Bacchae and Ifigenia in Aulis received their first award, which were awarded posthumously at initial presentation. Our collection contains 54 quotes who is written / told by Euripides, under the main topics: Happiness, Forgiveness, Happiness, Wisdom. "Happiness is brief. It will not stay. God batters at its sails"
"The good and the wise lead quiet lives"
"Silence is true wisdom's best reply"
"Life has no blessing like a prudent friend"
"He is not a lover who does not love forever"
"Youth is the best time to be rich, and the best time to be poor"
"Whoso neglects learning in his youth, loses the past and is dead for the future"
"Slight not what's near through aiming at what's far"
"Ignorance of one's misfortunes is clear gain"
"I would prefer as friend a good man ignorant than one more clever who is evil too"
"God hates violence. He has ordained that all men fairly possess their property, not seize it"
"Chance fights ever on the side of the prudent"
"'Twas but my tongue, 'twas not my soul that swore"
"Forgive, son; men are men; they needs must err"
"Question everything. Learn something. Answer nothing"
"Joint undertakings stand a better chance when they benefit both sides"
"Do not plan for ventures before finishing what's at hand"
"The bold are helpless without cleverness"
"Some wisdom you must learn from one who's wise"
"Love is all we have, the only way that each can help the other"
"But learn that to die is a debt we must all pay"
"Better a serpent than a stepmother!" "When a man's stomach is full it makes no difference whether he is rich or poor"
"The best of seers is he who guesses well"
"The best and safest thing is to keep a balance in your life, acknowledge the great powers around us and in us. If you can do that, and live that way, you are really a wise man"
"Silver and gold are not the only coin; virtue too passes current all over the world"
"In misfortune, which friend remains a friend?" "Impudence is the worst of all human diseases"
"Events will take their course, it is no good of being angry at them; he is happiest who wisely turns them to the best account"
"Danger gleams like sunshine to a brave man's eyes"
"There is just one life for each of us: our own"
"One does nothing who tries to console a despondent person with word. A friend is one who aids with deeds at a critical time when deeds are called for"
"No one is happy all his life long"
"Luckier than one's neighbor, but still not happy"
"Among mortals second thoughts are wisest"
"No one can confidently say that he will still be living tomorrow"
"Human misery must somewhere have a stop; there is no wind that always blows a storm"
"Friends show their love in times of trouble"
"Wealth stays with us a little moment if at all: only our characters are steadfast, not our gold"
"It's not beauty but fine qualities, my girl, that keep a husband"
"He was a wise man who originated the idea of God"
"Fortune truly helps those who are of good judgment"
"Down on your knees, and thank heaven, fasting, for a good man's love"
"Do not consider painful what is good for you"
"Authority is never without hate"